Just a quick note – I’m in the process of publishing a book, Clojure Recipes. You can see it for presale on Amazon here. This post shows you how to setup Datomic running on Cassandra using Virtualbox VMs from scratch. This is non-trivial and if everything goes well, will probably take a couple of hours. Note that this are my notes from going through this process, so there will definitely be room for improvement, either a simpler way to do things or a better way to explain what is going on. This has been written for a Macbook Pro Retina running MacOS X 10.9.3 (Mavericks) with 16GB of RAM. You’ll need to make a judgment as to whether your setup is similar enough for these steps to apply to your system. to actually do this – you need a datomic pro evaluation key – you can get this by registering on the my.datomic.com site – and then under Account click Send licence key and under Downloads – and also get the latest version of Datomic Pro. Note that steps A-J are here. 57. Modify the cassandra template to setup the properties of our local instance. Note this down – this will be the URI to connect. Voila – you have a Datomic database running on Cassandra across three nodes! My book Clojure Recipes, is to be published for sale on October, 2015. Developers are discovering the immense power of Clojure’s functional programming model to quickly solve problems in domains ranging from social networking to Big Data. Targeting the Java Virtual Machine, Clojure also leverages the Java platform’s maturity and enormous ecosystem. Clojure Recipes is a “code recipe book” for this increasingly popular language. Julian Gamble (Sydney, Australia) is a software engineer who has worked in the financial services industry for more than a decade. When he’s not enabling billions of dollars to orbit the globe, he writes and presents on all things software related. Isn’t there another book with a similar title? We think it’s great that the Clojure community has grown beyond ‘Introduction to Clojure’ books. We’re both seeking to grow the Clojure community. They have a fantastic team working on it and we wish them all the best. When did you start with this? I signed a Contract last December with Pearson publishing. Since then I’ve had my head down getting it ready. One of my friends described Lambdajam 2013 Brisbane as ‘One of the funnest conferences I’ve been on.’ I had a blast. I gave a Lightning Talk on Clojure. This is the tenth chapter of a series of posts about porting The Little Schemer to Clojure. You may wish to read the intro. So far we’ve covered flat data structures, reading flat data structures, creating data structures, creating a numeric tower, working with multiple occurrences of a match in the list, changing our functions to work with nested lists, building a numerical expression evaluator, performing analysis on sets and numeric functions and deriving the Y-Combinator. This is another one that gets the same idea across. It might seem unimaginably crude, but it conveys the big idea of what this post is all about. LISP is a programmable programming language. It is also the language with the most minimal syntax. If it has the most minimal syntax – then it must also be the easiest to implement. 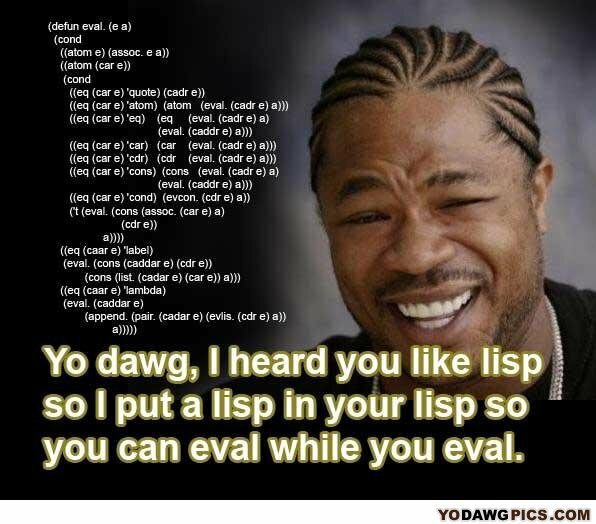 So one of the benefits of Lisp is that it is the easiest to implement (even it itself). That’s what we’ll do today. On the business end of things – there comes a time when we need to build a parser for a client app. This might be for a calculator that reads an equation to build a graph or do a financial calculation. Or it might be one of the other seven scenarios Steve Yegge lists here. The point is – you need to write a program that reads programs (and even evaluates them). Now please have some patience with what follows. This is a port from Scheme to Clojure. (This is 1974ish Scheme in a point in time with dinosaurs down the road and no built in map data structures in the language). This is trying to build everything the book has covered from the the ground up – so <sigh> we’re going to build a map data structure. We’ll start with a key-value pair to put in our map. Then we’ll build a function to get a value out of the map by key value. But first we’ll write a handler that gets passed in saying what the author wants to happen when the entry is not found. The only quirk to this definition is that we only take the first atom quoted and ignore the rest. You may consider this a bug in the book! We’ll stick to the book’s definition for now. We’re now going to look at cond (defined in the scheme way – not the Clojure way). I’m sure you didn’t really need that – but the authors of the book seemed to think it would aid readability. This maps the scheme primitive functions to corresponding clojure ones. As an aside – this reliance on function chaining is almost the opposite of what we want. Instead we want to be able to represent chained function calls as data structures – to make the overhead of calls in recursion much cheaper. This representation makes it more expensive. Consider it a toy to stretch your brain and how you think about functions. We’ve got to the end now – and are about to do our closing demos – and yet the book leaves out a critical piece which is disappointing. We want to be able to take all the functions in the book, and run them in our new evaluator – to fully close the conceptual loop. The authors however leave out define. We’re left to define everything with anonymous functions. We could do it ourselves, but that’s beyond the scope of this blog post. We’ll finish by taking our evaluator for a spin. You can see an example of this running here. This is the ninth chapter of a series of posts about porting The Little Schemer to Clojure. You may wish to read the intro. So far we’ve covered flat data structures, reading flat data structures, creating data structures, creating a numeric tower, working with multiple occurrences of a match in the list, changing our functions to work with nested lists, building a numerical expression evaluator and performing analysis on sets and numeric functions. This chapter is one of the high points of the whole book. You may have heard of Paul Graham’s VC fund, YCombinator – in this session we’ll not only explain the programming concept of the YCombinator – we’ll derive it in Clojure. Ok – so before we get started – what is it? What is this YCombinator concept everyone is so excited about? Here goes. The YCombinator is a way to do recursion in a language that doesn’t support recursion. Instead recursion is defined as a set of rewrite rules. “What?” I hear you saying. “All the languages I use have recursion, is this just some old hack that people used in the 60’s before they had real languages? Why should I get excited about that?” Fair enough. On it’s own its utility is limited, but it becomes a conceptual building block for lazy functional data structures – which are one of the things that people get excited about in Clojure – and something we don’t see in curly brace languages. So anyway – let’s get started. We’ll start with the rember-f function. This takes a list of items, an addition atom and a comparison function. The point is to demonstrate passing functions around. So we passed in the equals function (=) and it was used to test equality with the other item passed in. Now we’re going to start looking at writing functions to be curried. By currying we’re referring to the Mathematician Haskell Curry – for whom this is named. The idea of currying a function is that you can pass in fewer than all the functions required for the function to execute, and still pass the result around as a function (now with fewer arguments). That was so much fun, we’ll do it again with something similar, the insertL-f function. Ok – what if we do that again – but don’t pass in seqL as a named function – just implement it in the definition of insertL? You can argue that this is better as we don’t have to remember as many function names. Now we’ll look at the subst function from Chapter 3. It’s time for another Commandment. The Tenth Commandment states that you should “Abstract functions with common structures into a single function“. This is kind of like extract method – except that you pass the method in as a closure. Now we’ll go back to the value function from Chapter 7. So that was a bit shorter. Now we’ll look at subset? and intersect? from Chapter 8. What we notice is that these two functions only differ in their use of and true and or nil. We can try and abstract them as we’ve done before. The tricky thing there was the recursive use and definition of intersect? ie assuming we could use a function before we had defined it in one function, and then using that function to define insersect? – somewhat brain bending! You can see we wrote set-f to accept and-prime and or-prime as functions passed in as arguments. Ok so why did we bother with that one? We’ll its like how we replaced insertL with insert-g – except we applied it to a function that already returns functions. Let’s look at how we use it. We can use curry-maker to define mrember-curry with curry-maker. Ok – we’re about half way there. Now for any internal expression inside a function, we can wrap it in an applied lamdba (fn in clojure) and still have it return the same result. We’ll do that for our function-maker function. Ok – that all still works ok.
Now – our function-maker is in a way double-curried. What if we curry it again? This is where the book recommends you take a rest. We’ll push on. ; careful re use of first and second here - as yet undefined! What an interesting stream of numbers! Deriving the Y Combinator in Scheme. This is the eighth Chapter of a series of posts about porting The Little Schemer to Clojure. You may wish to read the intro. So far we’ve covered flat data structures, reading flat data structures, creating data structures, creating a numeric tower, working with multiple occurrences of a match in the list, changing our functions to work with nested lists and building a numerical expression evaluator. This chapter we’ll look at sets, relations and functions (in the mathematical sense). So starting with set? let’s see if a list contains a set of unique items. Note that this assumes the implementation of member? from Chapter 5. Now we’ll look closer at functions. You’ll remember that for a set of pairs to be a function, there must be only one domain value – ie the first values from a set of pairs must themselves be a set. We’ll borrow our definition of member* from Chapter 6. Now just in case you ever wanted to reverse the elements in their pairs and order in the list – we bring you revrel. (It is actually a building block for other functions to come). You can see this running here. This chapter we’ve looked at sets, relations and functions (in the mathematical sense). We haven’t really added any new primitives this chapter (thank goodness!). In total our primitives so far are: atom?, null?, first, rest, cond, fn, def, empty?,=, cons, add1,, sub1, one? and expt. These are all the functions (and those in the chapters to come) that we’ll need to implement to get our metacircular interpreter working. This is the seventh Chapter of a series of posts about porting The Little Schemer to Clojure. You may wish to read the intro. So far we’ve covered flat data structures, reading flat data structures, creating data structures, creating a numeric tower, working with multiple occurrences of a match in the list, and changing our functions to work with nested lists. In this chapter we’re driving towards our metacircular interpreter by starting to look at evaluating numerical values. So we’ll look at building an expression, breaking it down into operators and operands, and then handling it and returning a result. So let’s get started! So now let’s do numbered to test for S-expressions that we can evaluate as a numeric expression. Hmm – notice that the final expression became true in this version, but was false in the previous? That’s an assumption we’re making with this new version – that we know already this is an arithmetic expression. One might think this defeats the purpose of this function. I digress. – On all the subexpressions of a representation of an arithmetic expression. The big idea is that we’re starting to make a distinction between code and data. We’re saying that data functions recur on data, and code functions recur on code. Now in my view that was a little silly. The book included a non-working version of value just to illustrate a violation of the Eighth Commandment. Let’s get on with it. Cool – now – just to illustrate the power of abstraction by functions – we’ll switch back from prefix to infix functions. Time for another Commandment – The Ninth Commandment States Use helper functions to abstract from representations. Part of this is the java concept of eclipse’s extract method. Part of it is the power this gives you to change the function across the whole application and have it impact many parts of the system – ie a wide-ranging refactor. Now we’re testing for null?. Although we had to write our own helper method for this in Chapter 1 – now as part of implementing the metacircular interpreter – we’re re-implementing it in terms of other functions so keep our api minimal. Now it turns out this fails the conversion from Scheme to Clojure. We get the big idea. We’ll just move on. Now we’re going to build our own numeric system out of parenthesis – again, just to make the implementation of our metacircular interpreter more pure and easier to implement. This is significant because we’re going to build up our own number representation out of parentheses – admittedly a strange exercise – but going to prove that we can do maths in a lisp implemented in itself. Ok – maybe that didn’t make sense – let’s give a few examples. So now zero is (), one is (()), and two is (()()). Let’s do some operations on our new numeric representation – we’ll start with a new definition of add1. You can see it running here. Why is this chapter called shadows? I haven’t figured that out. Perhaps it is a shadow of things to come. Here we’ve started on the journey of the metacircular interpreter by writing an evaluator for arithmetic expressions. The only primitive we added was expt. This is the sixth Chapter of a series of posts about porting The Little Schemer to Clojure. You may wish to read the intro. So far we’ve covered flat data structures, reading flat data structures, creating data structures, creating a numeric tower, and working with multiple occurrences of a match in the list. What about nested lists? Would our functions work for those? Not yet. This chapter we’ll fix that. First we’ll look at leftmost (which also involves defining non-atom? and not). The point of this function is to find the leftmost S-expression, even if it is an empty list (). Now we’ll write rember*. What we’re doing here is to remove all matching list members from within the nested list. Now we’ll do insertR*. The point of this one is to insert a new element to the right of the matching element, no matter where is occurs in the nested list. When recurring on a list of atoms, lat, or a vec, vec, ask two questions about them, and use (rest lat) or (rest vec) for the natural recursion. When recurring on a list of S-expressions, l, ask three questions: (null? l), (atom? (first l)), and (non-atom? (first l)); and use (first l) and (rest l) for the natural recursion. When recurring on a number, n, ask two questions, and use (sub1 n) for the natural recursion. So what happened there? We extended our recursion checks to be able to handle nested lists. Now let’s do occur*. The point of this one is to count the occurrences of a matching list member inside a nested list. Now we’ll do subst*. What we want to achieve is a find and replace inside a nested list. Now let’s look at insertL. This is quite similar to insertR above – but now we insert the new value to the left of the matching value. Now we’ll look at testing list equality using eqlist? Now we’ll take a look at rember. At this point the Chapter takes a brief digression from modifying algorithms handle nested lists to focus on the art of refactoring itself. This version of rember differs from the one before by removing a matching S-expression rather than the first matching atom. Now we’ll do a refactor of rember. The point here is just to illustrate simplification by removing redundant code. Now we’ll do a another refactor of rember. Now we’re making it similar by pushing out the tests from the outer cond to the inner. Now we’ll take one more crack at refactoring insertL*. This time by removing redundant code. In some ways obvious – in other ways so profound that Martin Fowler wrote a whole book about it. The point is that optimisations of your code size are great – but get it working first. Here we’ve adapted our existing functions to be able to work for multiple occurrences of the search result. This chapter we didn’t add any true primitives, not_ and non-atom are entirely composed of existing primtives. In total our primitives so far are: atom?, null?, first, rest, cond, fn, def, empty?,=, cons, add1, sub1 and one?. These are all the functions (and those in the chapters to come) that we’ll need to implement to get our metacircular interpreter working. This is the fifth Chapter of a series of posts about porting The Little Schemer to Clojure. You may wish to read the intro. Ok – so far we’ve introduced lists [Ch1], we’ve pulled things out of lists [Ch2], we’ve built lists [Ch3] and we’ve assembled a minimal numeric tower[Ch4]. The assumption behind all of these was that we were only reading or making one change at a time. This time we’ll extend our capabilities to handle multiple items. To put it another way – this chapter is all about the ‘find all’ and the ‘replace all’. We’ll start with some revision – we’ll go back to our old friend member. Now the particular point we’re looking at now is that this function will stop at the first occurrence of a in lat. Now we’ll go back to another old friend rember. The main difference is that we keep calling the function until the end of the lat, even if the result is found. when using rest, test termination with empty? when using sub1, test termination with zero? Ok – so apart from knowing the principles to have confidence in writing recursive code in the future – why else is this relevant? It’s important for building more complex data structures. One of Clojure’s key strengths is that it has lazy functional data structures. Clojure’s data structures are built around this idea of hash-trie. It’s the idea that you can modify a tree structure that is still immutable and performant. The point being – you need to start building blocks for how you think about data structures. Now we’re going to do occur which is a bit like the aggregate count function in sql. Here we’ve adapted our existing functions to be able to work for multiple occurrences of the search result. We’ve added one new primitive function: one? So how is remove implemented in Clojure? This is more concise – but requires knowledge of the filter and complement functions – which we’ve chosen to exclude to keep a simple set of primitives. This is the fourth Chapter of a series of posts about porting The Little Schemer to Clojure. You may wish to read the intro. You’ll notice that in the first three chapters, we introduced lists [Ch1], then we pulled things out of lists [Ch2], and then we built lists [Ch3]. The bigger principle of the book is to be able to operate on data structures with a minimal set of primitives using the power of recursion and lambdas. Now we’re driving at the meta-circular interpreter with these principles. We also want to be able to do mathematical operations, and yet still keep a minimal number of primitives. Interestingly enough, we’ll just use equals, add1 and sub1 and build up to multiplication, division and exponents. So let’s get started! Our first function is +_ (plus) – we’re going to define it terms of add1 and sub1. (We’ll rename the functions with an _ suffix so they don’t clash with the existing clojure definitions of + and zero? Now this is kind of frustrating. Why bother doing all this recursion for an operation that is already built into the CPU? Especially when you limit yourself to integers anyway? This is about making you think about numeric implementations. Part of it is that LISPs generally implement their own ‘numeric tower’ – you can see what fresh thinking has done for Clojure’s ability to handle numbers – particularly irrational fractions. From here we extend our concept of the lat (a List-ATom) – being a non-nested list of atoms. We extend it to what the book calls a vec, which is a non-nested list of integers. From here we arrive at [The Fourth Commandment]. This states When recurring on a list of atoms, lat, or a vec, ask two questions about them, and use (cdr lat) or (cdr vec) for the natural recursion. It then goes on to apply this to lists of numbers as well. It goes on: When recurring on a number, n, ask two questions, and use (sub1 n) for the natural recursion. Next we look at the multiply function *_. Again – we’ve built this in terms of our existing primitives. Now we get onto The Fifth Commandment. I know these could come across as boring and self-righteous. On the other hand, if you write recursive code from scratch (and don’t rely on a library to do it for you) you want to have absolute confidence that it will run and terminate as you expect. These Commandments give you that confidence. The Fifth Commandment states: When building a value with +_ (plus), always use 0 for the value of the terminating line, for adding 0 does not change the value of an addition. It goes on to say: when building a value with *_(multiply), always use 1 for the value of the terminating line, for multiplying by 1 does not change the value of a multiplication. It then finishes with: when building a value with cons, always consider () for the value of the terminating line. Now we’ll look at >_(greater than). We’ll define it in terms of our primitives. Now we’re going to write a function pick to get an item out of a list using an index. Now we’re going to write a function to strip all the numbers out of a list. We’ll cheat a little bit, as we’ll introduce a new primitive function number?. We’ll call our strip function no-nums. This chapter we’ve introduced two new primtives add1 and sub1 – and used them along with all our existing primitives to build all the functions above. In total our primitives so far are: atom?, null?, first, rest, cond, fn, def, empty?, =, cons, add1 and sub1. These are all the functions (and those in the chapters to come) that we’ll need to implement to get our metacircular interpreter working.